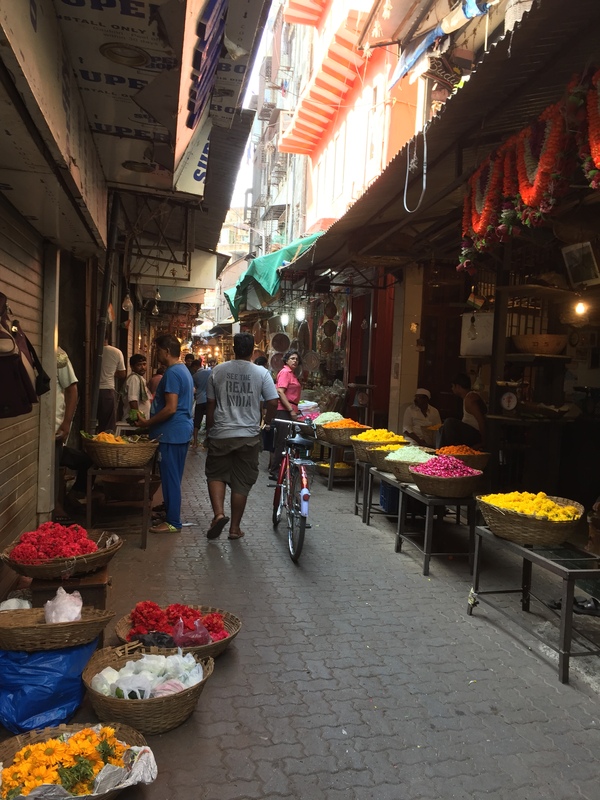 india travels: south bombay bicycle tour. 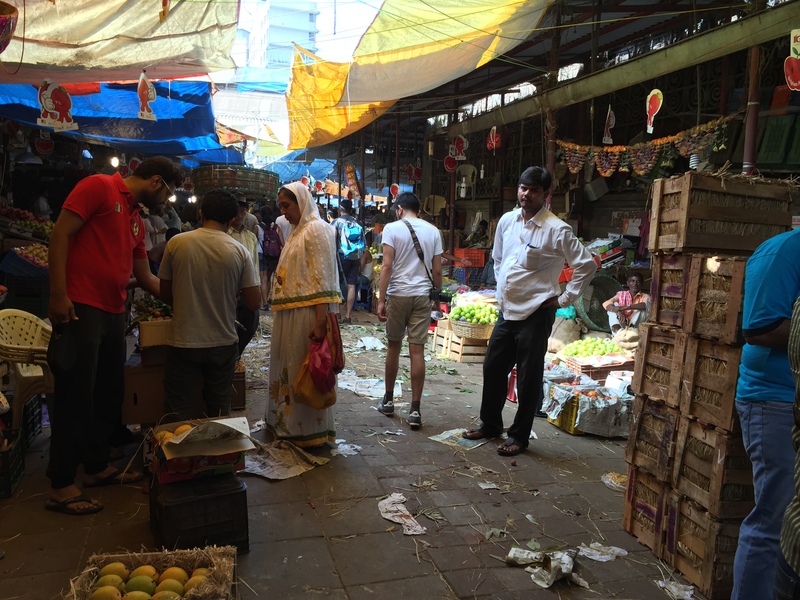 while in bombay i used my free weekend to do an early morning south bombay bicycle tour with reality tours and travel. 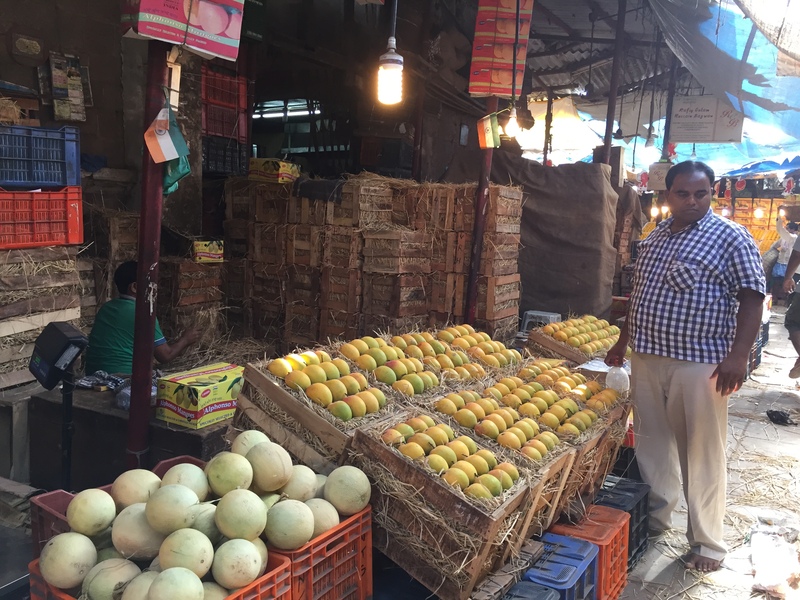 reality are most well-known for their in-depth tour of dharavi, one of the largest slums in asia, but they run a number of other tours as well: the bicycle tour, a market tour, a night tour, a street food tour, a sightseeing tour, and a village tour. i had gone on the tour of dharavi in 2013, so i decided to check out one of their other offerings on this journey. 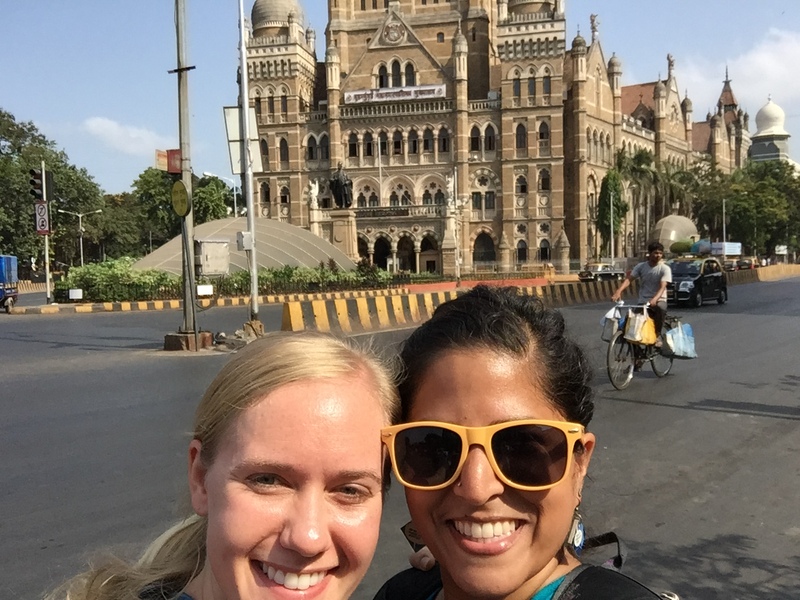 since bettina would also be passing through bombay over the same weekend, we decided to do the early morning bicycle tour of south bombay. so, after too few hours of sleep, we got ourselves up on sunday morning and made the trek from powai to colaba to meet up with the reality guides and our fellow cyclists. after some brief introductions, we tested out a few cycles to make sure we were all comfortable, we got a rundown of the morning’s schedule, and off we set into the bombay dawn. our first stop was the sassoon docks and fish market*. teeming with activity, even at 6.45am on a sunday, we observed men and women of all ages scurrying around hauling all types of seafood in front of and behind them as well as on top of their heads. the fish market is one of those places where if you stand still for too long – you know, longer than 5 seconds – you are definitely going to get shouted at and probably run over as well. it was fascinating, and although i would have enjoyed observing the activities for more time, it was also very chaotic and a bit overwhelming. marine drive on a quiet sunday morning. bombay, india. may 2015.
our morning cycle group. bombay, india. may 2015.
after some time spent on marine drive, we took off for bombay panjrapole. panjrapole is a shelter primarily for cows, but they house a number of other stray animals as well. it was established by a trust nearly 100 years ago, and it is hidden in the by-lanes of south bombay that i would never be able to find on my own. we spent some time feeding the pregnant cows and visiting the newly-born calves, and we learned about the trust that sustains and runs the shelter. after our visit to panjrapole, we had a very refreshing cup of chai before venturing on to phool galli, one of the oldest flower markets in bombay. we walked our cycles through the gully, taking in the sight of flowers ready for purchase and enjoying the amazing fragrance they give off. it’s almost enough to make you forget you are in india…almost. 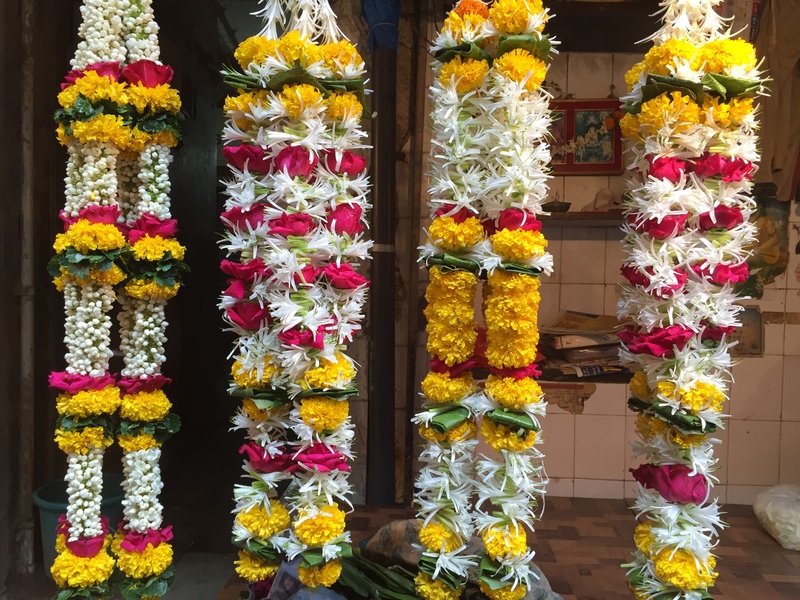 all the garlands lined up and ready for celebrations. bombay, india. may 2015.
we emerged from phool galli to the crowds gathered outside the mumbadevi temple*. the namesake of the city and the goddess of its original inhabitants, the mumbadevi temple is one of the most well-known and busiest temples in all of bombay. as we stood outside and learned about its history and its significance, we marveled at the crowds lining up – at 8.15am – to enter and pay their respects. from mumbadevi we hopped back on our cycles to make our way over to crawford market, one of my favourite spots in the city. 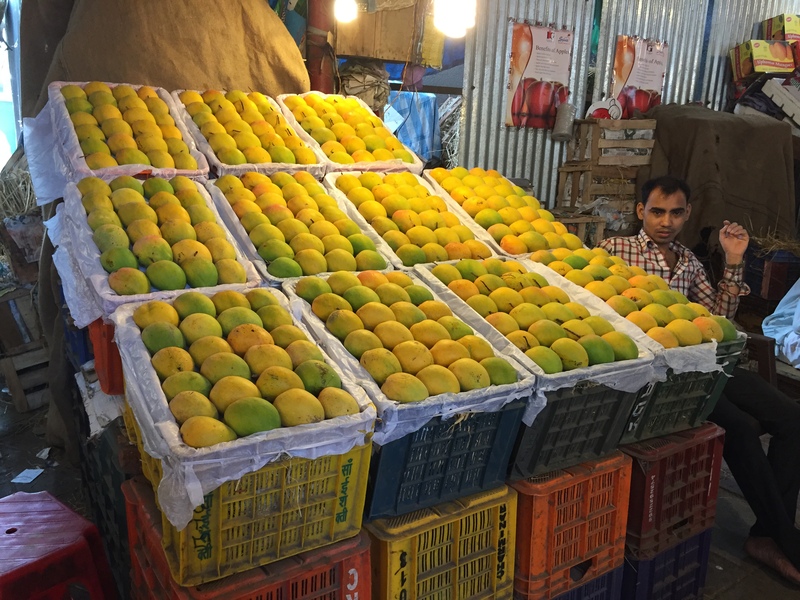 it’s so much fun to wander through the rows and marvel at everything on display — i for one couldn’t get over the rows and rows [and rows and rows] of different varieties of mangoes. 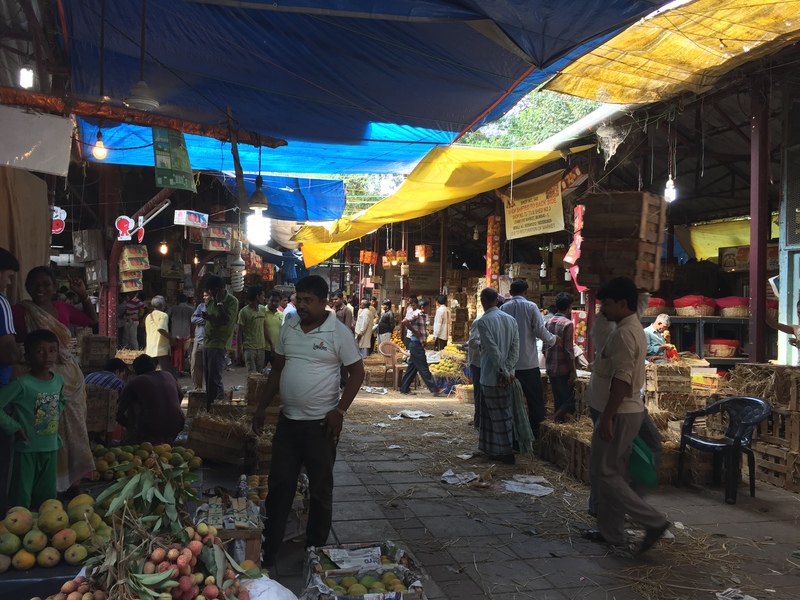 even so early on a sunday, crawford market does a bustling trade, and our little jaunt provided a great glimpse into what it must be like on a weekday morning. fun fact: in 1882, the building that houses crawford market was the first in all of india to be lit up with electricity. strolling through crawford market on a sunday morning. bombay, india. may 2015.
so proud of his fruit collection. bombay, india. may 2015.
i want to eat all the mangoes. bombay, india. 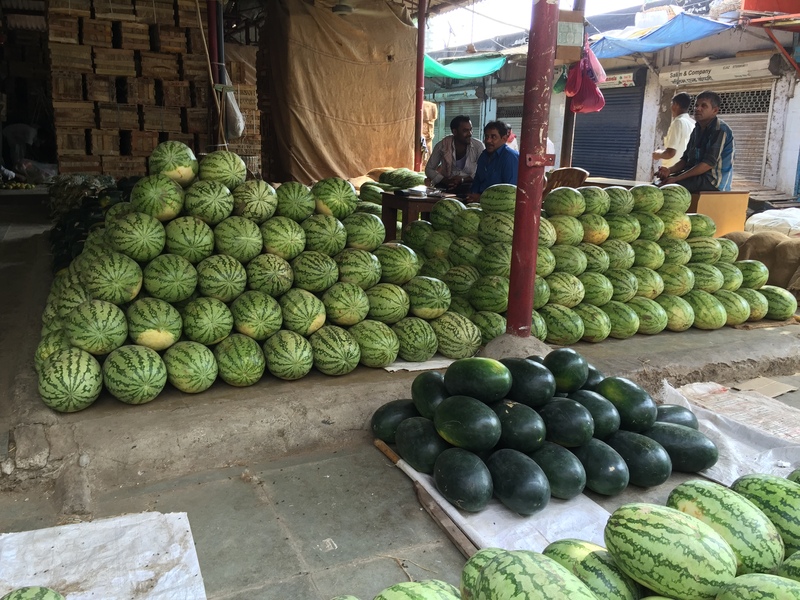 may 2015.
watermelons stacked up in crawford market. bombay, india. may 2015.
on our way out. bombay, india. 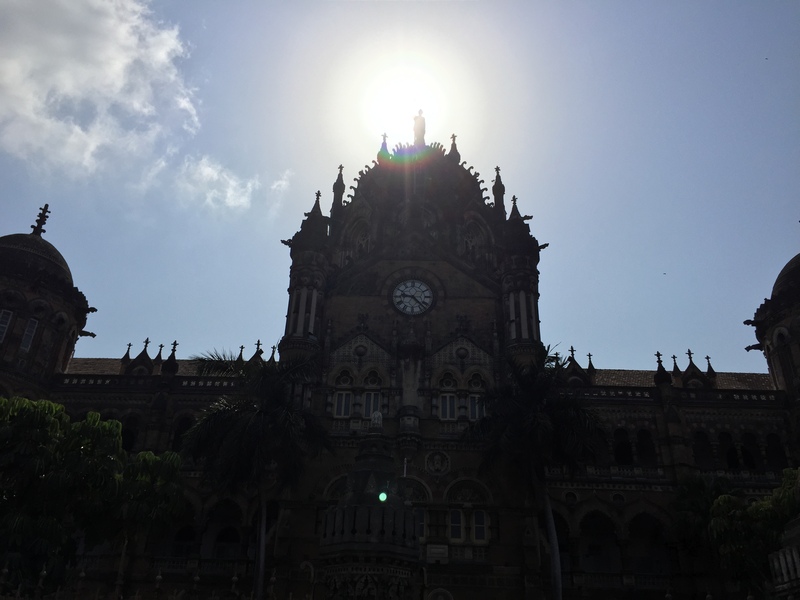 may 2015.
our last stop of the day before breakfast was the chhatrapati shivaji terminus – or cst – train station. 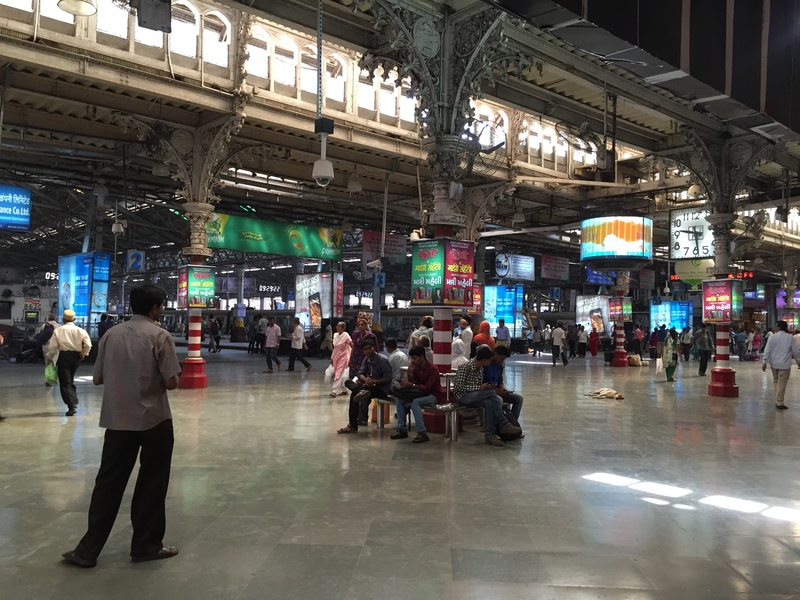 also referred to as victoria terminus, cst is where you go for all of your train needs. the booking offices are there, and most of the long-distance trains will depart from and arrive there. it’s a beautiful structure in the heart of south bombay, and it can be absolutely bonkers at times. we used to catch the train to surat from cst when i was a kid, and i still remember being amazing by the coolies with suitcases upon suitcases piled on their heads. sadly the coolies are nowhere to be seen anymore, but the station still holds a lot of history, which is why it is now a unesco world heritage site. playing tourist with bettina. bombay, india. may 2015.
the grand clock at cst. bombay, india. may 2015.
one the many entrances into cst. bombay, india. 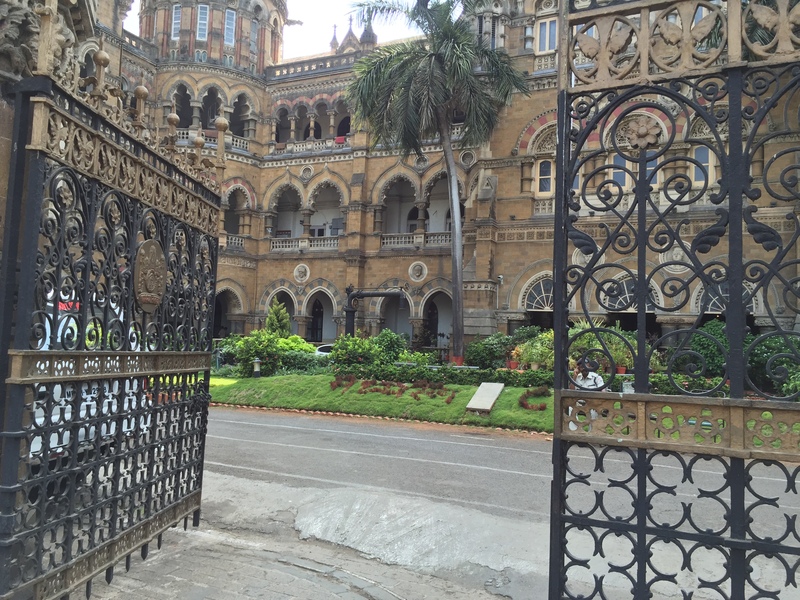 may 2015.
the calm before – or probably after – the storm in cst. bombay, india. 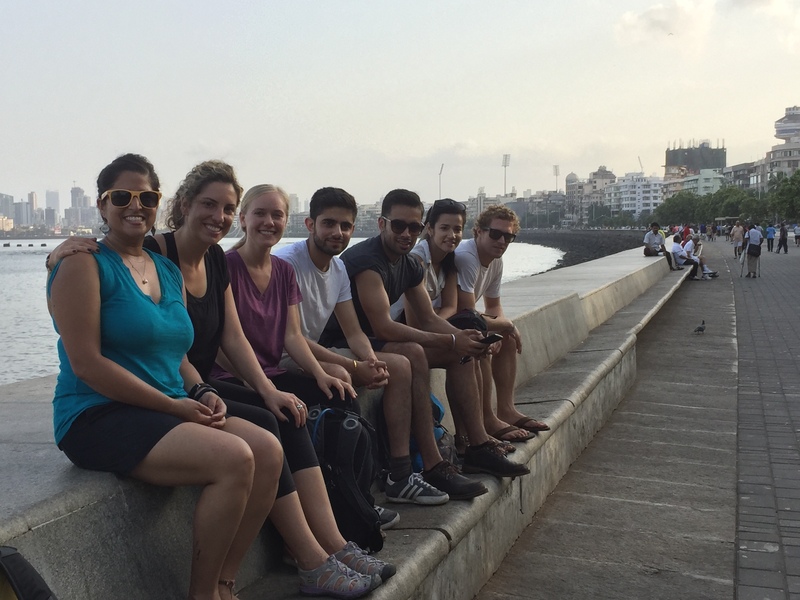 may 2015.
we wrapped up the sightseeing part of our tour at cst, returned our bikes to colaba, and headed over to madras cafe for a delicious breakfast. 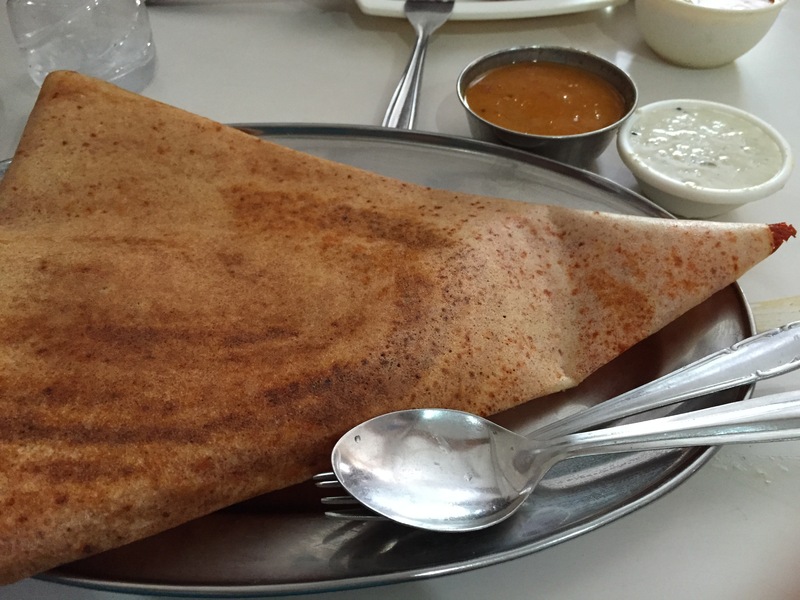 i went with a mysore masala dosa, and i am not exaggerating when i say it was one of the best i’ve ever had. it was nice to have some time to chat with the other people on the trip as well as our guides, and it was a lovely way to wrap up the morning. when? the tour runs every day from 6.15-10am. i personally loved doing it on a sunday morning, when the city takes a little longer to wake up, but i imagine it would be great any day of the week. how much does it cost? the tour costs rs. 1,400 per person, or rs. 6,000 for a private tour of up to 5 people. what does it include? a bicycle for you to ride for the duration of the tour; two guides, one to ride in the front and guide everyone, and one to follow behind and make sure the group stays together; chai – or coffee – and bananas about midway through the tour; and breakfast at madras cafe at the end. helmets can be provided upon request. do i need to book in advance? yes, definitely. they require a minimum number of participants to run a tour and also have a maximum number so the group doesn’t get too large, so register ahead of time to make sure the tour will run on that day and you get a spot. what will i see? as mentioned above, you will see the docks and wholesale fish market; marine drive; bombay panjrapole; phool galli; mumbadevi temple; crawford market; and the cst railway station. you will also get a great glimpse of south bombay along the way, including colaba causeway, khala ghoda, and regal cinema. how difficult is it? the terrain is flat [if a little bumpy near panjrapole], and it’s a really easy ride. i have not ridden a bicycle since last august, and i was fine. although the duration of the tour is 3 hours 45 minutes, you are not riding the whole time. 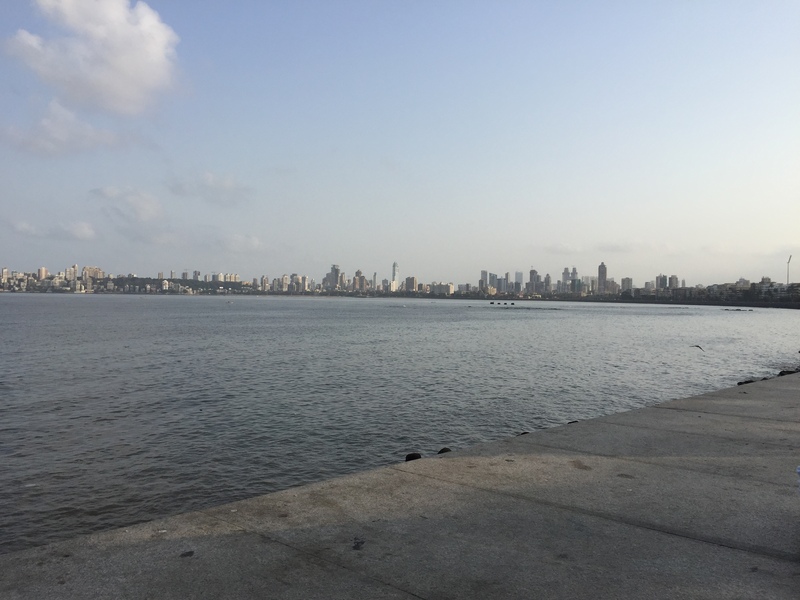 there are frequent stops to learn more about the history of the city or to hear about the different attractions; i think our longest stretch was about 25 minutes from marine drive to bombay panjrapole. what about the traffic? the tour is scheduled at this time for specifically that reason. there is not much traffic on the roads at that time, so although you should always be vigilant, it really wasn’t too busy. what do i need? lots of water if you are like me and get dehydrated easily; lots of sunscreen; sunglasses; a camera. closed-toe shoes are not required, but i would recommend them. more specifically, i would recommend trainers or sneakers — my toms looked a little sad after trudging through the docks. i openly admit that i am biased when it comes to recommending reality’s tours. steph, the former ceo, is a close friend of mine, and i have been a supporter of reality for a few years now. i love that they show parts of bombay you wouldn’t normally see on your own, and i love their model of giving 80% of their proceeds back to the dharavi community through their sister ngo, reality gives. and i am not the only one who loves them — the organization is continually winning awards for their tours and their model. if you live in bombay or are just passing through, i strongly encourage you to participate in one of the many tours that reality offers. i definitely think the dharavi tour is their best, but all are worth a visit. there’s a reason they are ranked #1 out of all bombay attractions on tripadvisor. if you are not in bombay, reality also offers city tours in delhi as well as multi-day tours in kerala and rajasthan. check out their other offerings and sign up today! any other questions? i would be happy to answer, or to point you in the direction of someone else who can. i loved this tour, and i love this organization, and i want as many people as possible to experience all that they have to offer. have any of you been on a reality tour? what was your experience like? *photography is not allowed at the docks or mumbadevi, because they have been targets of terror plots in recent years. Someday I will come to India! I will keep reading your blog for tips and ideas. Will do 🙂 To be honest, I am quite skeptical about visiting India. I am still building my guts for now, but definitely I will come visit one day! Tim, this is a great way to see the old part of the city! And all of Reality’s other tours are really great as well. weekly roundup 16 // 2015.